Shalina Resources Ltd has established itself as a rapidly growing copper and cobalt producer in the DRC. "Chemaf SARL", a wholly owned subsidiary of Shalina Resources, operates the Etoile mining concession and processing facilities located at Usoke Avenue in Lubumbashi, Katanga. Shalina Resources has a modular approach to developing operations which has allowed it to self-fund the majority of its growth. The Company first started small-scale mining and mineral processing in 2002. It constructed a copper carbonate pilot plant, known as 'PP1', within its production facility based at Usoke Ave (in the industrial zone of Lubumbashi). At this time, annual production capacity was 500 tonnes of copper carbonate and 240 tonnes of cobalt carbonate that was recovered by precipitation. By continued re-investment of retained earnings, the Company has considerably increased its production capacity and surpassed 20,000 tpa copper cathode by the end of 2011. In 2004, Shalina Resources built its first sulphuric acid plant with capacity of 100tpd at Usoke Avenue and a new larger plant with an installed capacity of 500tpd was commissioned at the Etoile mine site in August 2010. It was built for the extra leaching capacity required to reach the long-term copper cathode production target of 50,000 tpa, which is expected to be reached in the next four years. In 2007, Shalina Resources bought the Mount Gordon Cu SX/EW plant from Australia and re-assembled it at the Usoke site. With this move, the company was able to commission the first phase of its Copper EW facility and start producing pure metal copper cathodes (design capacity of 16,000 tonnes per annum). In this year, the company also commissioned the Kilimasimba Stone Quarry, its purpose being to produce aggregates for construction. Both the acid and the aggregates operations give Shalina Resources access to strategic key production materials and this has enabled capital and production costs to be reduced. That is not to forget the local value addition and job creation also created by these operations. Furthermore, excess production of gravel and sulphuric acid not used in the production of Shalina cathodes is sold on long term contracts to supply local demand. Not only did this provide additional cash generating streams but it ensured greater domestic growth and spurred economic growth in Lubumbashi. The Kilimasimba quarry was recently sold due to reduced internal demand for aggregates. 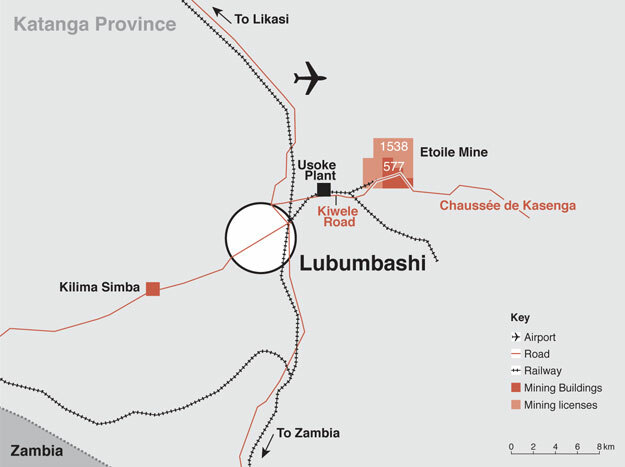 The Company is involved in mining activities at its Etoile mine, located close to Lubumbashi and adjacent to the Ruashi mine. The Company produces Oxide Ore, which is fed into Heavy Media Separation (HMS) plants that are located on Etoile site to produce copper and cobalt concentrate. The concentrate is used as the primary feed for the Usoke processing plant. Shalina Resources is a vertically integrated business, completing all the processes in house to convert raw ore to copper cathodes and cobalt carbonate. The copper consistently has grade A quality of more than 99.99% purity and is produced using solvent-extraction and electro-winning technology. The integration of the entire production process provides synergies to produce lower cost cathodes by capturing additional value in the production chain.